If you’re looking for a classic home with helpful extras, our one and two bedroom apartments for rent in Lafayette are the perfect answer. When you choose a pet-friendly two bedroom apartment at French Colony Apartments, you and your pet can cozy up next to a warm fireplace when the winter months hit. You will also find spacious walk-in closets that have plenty of room to fit your wardrobe. The two bedroom apartment also includes wash and dryer connections, so when laundry day comes around, you’ll be prepared from the comfort of your own home. No matter which floor plan you choose, rest assured knowing that you have high-speed internet access and concierge-style serve ready whenever you need something. Both the one and two bedroom floor plans are designed to give you the best value for your dollar. 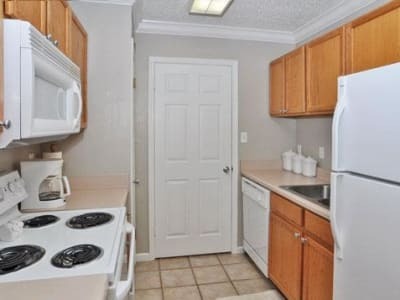 Full kitchens with convenient extras like a dishwasher, garbage disposal, and refrigerator, gives you the ideal environment to create your favorite dishes. Don’t worry about sweating through the humid LA summers. You’ll stay cool and refreshed in our air conditioned apartments equipped with ceiling fans that help create the perfect light breeze. To see our spacious one bedroom or two bedroom apartments in person, call our leasing office to schedule a personal tour. *First and third Saturday each month.